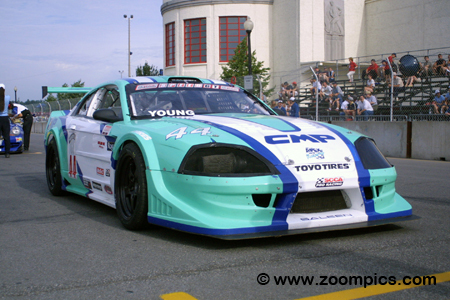 Round seven of the 2002 SCCA Pro Racing Speed World Challenge series was conducted on Quebec’s Le Circuit Trois-Rivieres. Only fourteen drivers competed on the eleven-turn 1.53-mile temporary street circuit. 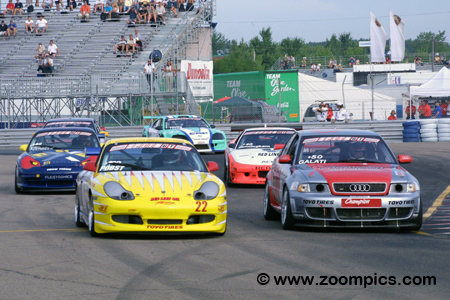 The pace lap for round seven at Le Circuit Trois-Rivieres and fourteen competitors prepare to line-up for the start. 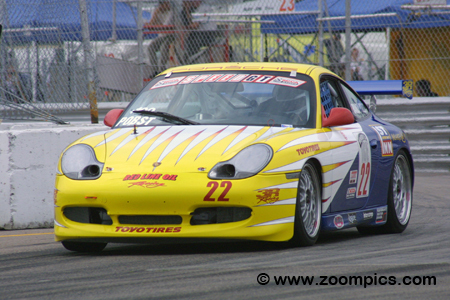 On the pole is the 3R Racing Porsche 911 GT3 Cup driven by Randy Pobst. Sharing the front row with Pobst is the point’s leader, Michael Galati in an Audi S4 Competition. In the second row is another Porsche piloted by Johannes van Overbeek and RealTime Racing’s team principal, Peter Cunningham in an Acura NSX SC. Randy Pobst started on the pole but there was the threat of Michael Galati, also on the front row, using his Audi’s all-wheel-drive system to beat him to the first corner. The series officials staggered the grid which may have worked to Pobst’s advantage. When the starting lights went out, Pobst led the field into turn one. He was able to retain the top spot and went flag-to-flag for the victory – his third of the season. The point’s leader Michael Galati was gridded on the outside of the front row but was not able to capitalize on his Audi’s all-wheel-drive feature. When the starting lights when out, Galati followed the pole-sitter, Randy Pobst into corner one. He challenged Pobst on several occasions but was never in a position to pass. At the finish, Galati was 1.159-seconds behind Pobst but padded his championship lead over Johannes van Overbeek. 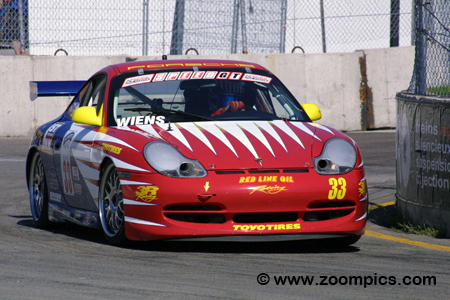 Entering round seven at Trois-Rivieres, Johannes van Overbeek driving the No. 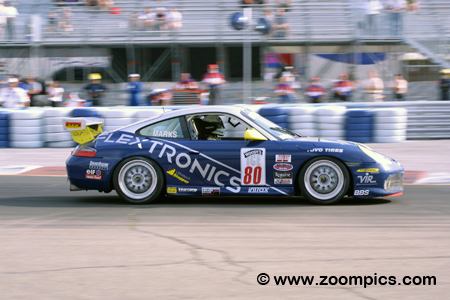 81 Porsche 911 GT3 Cup was trailing the point’s leader, Michael Galati in the title chase. 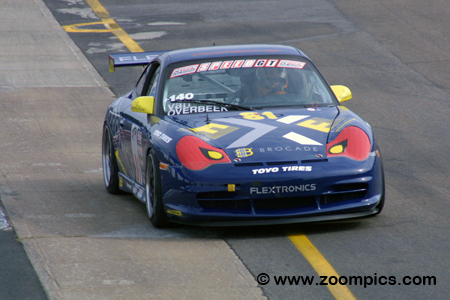 Van Overbeek was yet to win a series event in 2002 but he had five podium finishes. He was third quickest during qualifying and fell to fifth at the start of the contest. Van Overbeek was able to move into third place before the checkered flag – but was 27-points behind Galati. Gridded sixth for the start of round seven was John Young in the Contract Metal Products sponsored Saleen SR. Six top-ten finishes (his best to date was a fifth at Sebring International Raceway and RFK Memorial Street Circuit) in six races put Young within striking distance of the points leaders. 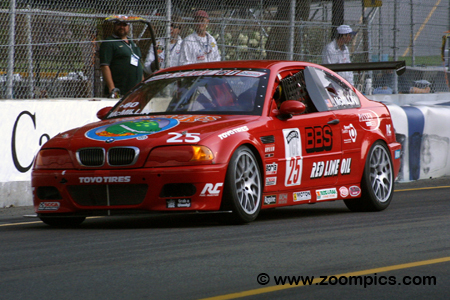 Benefitting from issues experienced by Derek Bell and Peter Cunningham, he was able to capture a fourth-place finish. Justin Marks rejoined the series at Trois-Rivieres after failing to start the Road America race and not entering the Washington, DC weekend. In qualifying, Marks was tenth quickest competing in the No. 80 Porsche 911 GT3 Cup. During the contest, he passed Bob Miller and David Farmer. Marks gained more positions when Peter Cunningham, Derek Bell and Phil McClure encountered problems. He had his best result of the year, fifth. This weekend’s Rogaine ‘Hair Raising Pass of the Race’ was awarded to Tim Wiens. Wiens was driving the No. 33 3R Racing prepared Porsche 911 GT3 Cup qualified eleventh and was as high a sixth place during the middle portion of the race but fell down the order after making a mistake. On lap-14, he passed Mosport winner, David Farmer to regain sixth and held the position until the checkered flag. This was Wiens' top finish to date. Jeff McMillin’s run of consecutive top-five finishes came to an end at Trois-Rivieres. 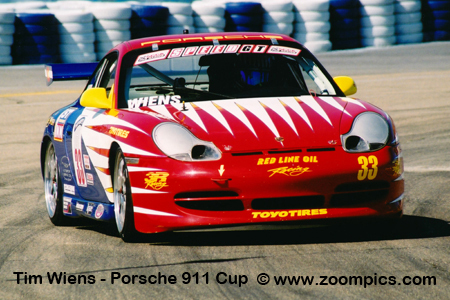 This impressive streak included three podiums (third-place finishes at Sebring International Raceway, Lime Rock Park and the RFK Memorial Street Circuit). In round seven, the driver of the McMillin Motorsports BMW M3 was gridded last for the start of the contest and a mechanical issue on lap-14 of 33 caused him to be the event’s first retiree.